Each image on the portfolio page denotes a page of images. Each image page includes up to 24 images. The images are thumbnails, which are details. Click on the thumbnail to get the whole piece, date made, size, and other information. The image pages are organized by date, most recent on page 1, oldest on the last page. The last page also includes images of my work space. I do commissions. I like working with people, exploring other tastes and new ideas. And as a retired carpenter Im very used to programs, budgets, schedules, and input from others. I've done both public and private commissions and want to do more. I usually install what I make. Most of the pieces of glass on this site are for sale. Prices range from $300 to $2,000, with most being less than $1,000. If you see something you like, please ask. The fragility of the glass does make it expensive to ship. Most of my sales have been direct and delivered in the Boston, MA area. Shipping suggestions are welcome. 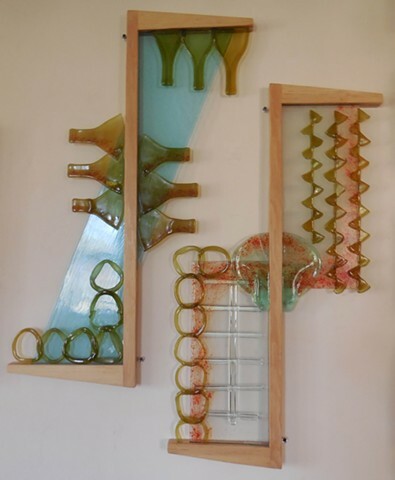 I'm happy in the rich, associative world of recycled glass, especially bottles, and other found objects, and focused on that most conventional quality of glass, its transparency. Not flat, not round, my work might be called glass relief. I like things that are funny. If my glass makes someone laugh, that's good. I use recycled materials, including bottles, plates, wood windows, and construction scrap to make residential sized panels and commissions. I'm self taught in glass, but my uncle, Richard Bassett was an artist and encouraged me to paint and draw when I was young. A clever and generous man, Joseph LeBeau worked for my grandmother and made wonderful toy machines from scrap wood, recycled nails, and left over house paint. He gave these toy machines to any kid who wanted them. I think I learned from Joseph LeBeau the joy of making things, the possibility of using recycled, discarded materials, the possibility of making something from nothing, and the fun of sharing. Since 1967 I worked as a carpenter. Before that I was an architectural draftsman. I've done glass since 1979. If there is consistency in what I make it is in the re-use of old stuff. Im interested in the richness of shape and texture of glass produced by slumping and fusing. I do panels for windows, commissions, and glass that can be shown on interior walls and doesnt need strong backlighting. Im interested in light, structure, line, texture, balance, and color in that order.